I found this recipe and used it a couple years in a row. season in the same amounts and got excellent results as well! Oh and since it is a bread machine recipe, it's trivial to make. Kick your shoes off and 1 hour later you have fresh Jam, if you want it hot. So what's that you say, I'm done? Not exactly. First off, I did a substitution to drive the calorie count down. Instead of 1 Cup of granulated Sugar, I substituted Stevia at the recommended amount of 1/3 Cup plus 1 Tablespoon. Why? The result was a less "cloyingly sweet" Jam. It turned out slightly tart and sweet at the same time. I love a good mango jelly/jam/whathaveyou. But I wanted to make something a bit lighter. In this case, I saved 774 calories across the three jars. Each jar was about 6 ounces, so figuring a tablespoon serving, it would bring it down from approximately 50 to approximately 30. Not exactly Earth-Shattering, but it made me feel better, and it gave me the taste I wanted. If you want a traditional jam, go full sugar. The texture and even the taste will be pretty much the same too. Secondly, it's Mango Season. Trees all over South Florida and other Northern Hemisphere tropical regions are bearing fruit. One tree makes an amazing amount of fruit. Literally by the bucket load. I have harvested two full buckets from a mature tree, gave away a third to various people, and there are at least one or two more buckets up there just out of reach. You just can't eat THAT many mangoes. The greenest ones I put in the refrigerator to slow down ripening. The ripest ones went into me, and into this jam, and I know I will make at least another batch to can. The ones in the middle I split between the fridge and the counter. While I really truly enjoy mangoes, even I get tired toward the end of season. Thirdly, I had a house guest who I sent home with a dozen mangoes. They should be just about ready to eat now, and this would be a good way to use up some of them if you have a bread machine and want an easy fix, or a big sauce pan and want a bit of a challenge. Finally, while this is not a Canning Recipe, specifically, I have made this up in the bread machine and then canned it and the jars were good for the typical 6 months to a year. All canning recipes can go wrong in storage, so you do so at your own risk. Since people don't really follow links, I'll reproduce the recipe from the above link here, word for word. 4 Cups chunked ripe Mango pieces. 1 Cup Sugar or other granulated sweetener such as Stevia as recommended on the package for substitution. 1 Package of unsweetened or sugar free Fruit Pectin. Cut up your Mangoes into chunks until you have four cups of the fruit. Mash slightly the Mangoes, and add to the bread machine's bucket with impeller blade in place. Add 1 Cup of Sugar or sweeteners. Add 1 Tablespoon of Lemon Juice. Add 1 Packet of SureJell Fruit Pectin. Select Jam and Jelly program on your bread machine and press start. Alternately, this may be cooked on medium on the stove until the jam begins to set at about 30 minutes. 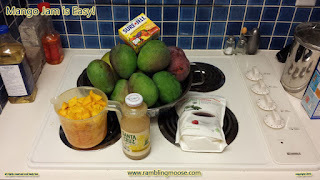 I did use this recipe to can some Mango Jam for later by boiling the jars and lids to sterilize, then boiling the jars to re-sterilize and set the lids. With all Canning Recipes, you are on your own to decide how long to store the result. Rack! Rack! Rack! Run! Run! Run! How About a Mango Lassi With Breakfast? Hey! Can A Dog Get A Little Privacy Here?